Watch his video above to see what I'm talking about! Funny stuff! Did you see Liz Banks (C'96) last night on the Valentine's Day episode of "30 Rock" where she played a CNBC political correspondent and love interest to Alec Baldwin's character? Sometime last year I came across this great "rant" that was published in the Wharton Undergraduate Journal by a Penn alum by the name of Fu-zu Jen (SEAS/WH, 2003). Her piece is dedicated to all those nice guys who finish last ...and it's a perfect post for my Valentine's Day Sampler Week. Check out her moving rant after the jump! "just saw somebody skiing down locust walk." 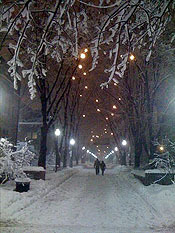 After the jump, check out 2 very visually cool time lapsed "snow" videos on Penn's campus! Check out a great interview Mike did about the movie after the jump! As part of my Valentine's Day Sampler Week, I have a treat for all of you. Like I did last year, I've got a special dedication to all of my readers from a bunch of Penn's Glee Club members above (wait until the end of the video)! Get the Penn Glee Club to serenade someone you know on campus. Learn more after the jump! For the past 3 years, I have dedicated Valentine's Day week to Penn "love-themed" stories. Become a DT fan on facebook HERE! At last year's Penn in Pictures event, Zach Lutsky (C'97, AEPi) talked about his experiences working as a medical consultant on the hit show "ER". Now Zach tells me about "Miami Medical", the new Jerry Bruckheimer CBS drama he's been working on that debuts on April 2. And if you saw the Superbowl yesterday, you would have seen the trailer for this new show during the 3rd quarter. Otherwise, check it out above! "I was intimately involved with the writing and choreographing of ALL of the medical scenes in each of the first 13 episodes. I still work as an attending emergency physician at Cedars-Sinai Medical Center." Miami Medical" is Jerry Bruckheimer's first medical drama about a "trauma-only" hospital in Florida. It is based on a real "trauma-only" hospital in Miami that is one of three such hospitals in the United States. It tells the story of a team of trauma surgeons handling the sickest and most severely injured trauma patients from accidents in and around Miami.